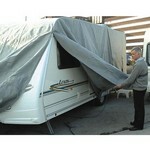 Caravan Covers manufactured from high quality, heavy duty 4 ply polypropylene fabric. These Caravan Covers from Maypole offer the best possible protection for your caravan at a great low price! Both Breathable and offering protection from UV with superior water resistance and protection from the elements for your caravan. All covers have elasticated hems to provide a snug fit in addition to nylon straps and buckles to fasten the cover firmly over your caravan. Zip openings on the near side allow easy access to the interior of the caravan without needing to remove the cover completely. Includes storage bag for when the caravan cover is not in use. Height and width: 228.6cm, 7'7" If your caravan is wider, eg 7ft 9 inches, then one seam will not be on the corner of the van but otherwise it will be fine. "Hello, just want to say thanks very much, got my charger next day as you said I would. Good idea to keep people informed of order progress, dispach ect. Take care, regards. "